Here’s a picture of my latest painting. Of course it’s of Miles on the bay playing in the sand with some other boys. It’s 20″ x 24″ Oil on Canvas. Fantastic work! Your son, Miles, is amazingly cute. Pardon my frantic behavior this evening! It was really just an altogether bizarre night. I’m truly honored to have stumbled across your life’s path. I would have enjoyed catching up more… maybe sometime? I know we’re pretty much strangers as adults, but it would be fun to reacquaint ourselves. I’ll try to stop in here from time to time to check out your work. it will be my pleasure! 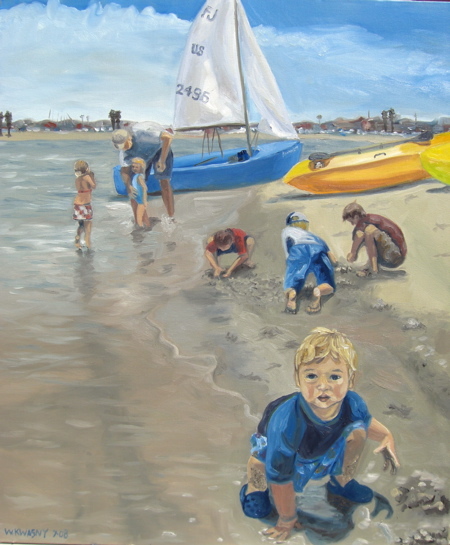 What a fun painting, and what a great way to capture memories! We just started “family art night” here–not that anyone is nearly as talented as you, lol–but it’s really been fun so far. Very relaxing. Makes me want to go sailing. But maybe not today. Brr.